Update: The full text of Senator Carper’s bill is now available, and we have more details about how it would change postal workers’ and retirees’ health insurance coverage here. The Senator who helped create the US Postal Service’s financial problems by co-authoring the disastrous 2006 PAEA law, is ready to offer yet another proposal to “fix” the USPS. 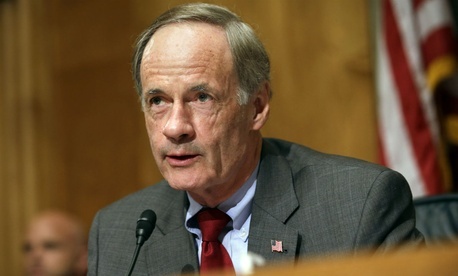 According to Government Executive, Senator Tom Carper’s latest bill would set up a separate postal service health benefit program (PSHBP) “within the Federal Employees Health Benefits Program and managed by the Office of Personnel Management”. All postal workers and retirees would be required to enroll in a PSHBP plan. Medicare would become the primary coverage for eligible employees and annuitants. The bill would also make the exigency rate increase permanent, and restrict the agency’s ability to close facilities and lower service standards. It would not require the USPS to continue Saturday mail delivery, but would encourage it to come up with new revenue sources. The law would also allow for a more realistic schedule for pre-funding future retiree health benefits, ending the arbitrary trust fund payments Carper’s PAEA law put into place. This guy is a complete fool and another solid example of Washington’s out of touch Politicians…Grow a pair Senator and repeal that Moronic PAEA you and your buddies stuck the Postal Service with in 2006, that you could use as your own Piggy Bank! Please resign! You are far too dumb to be leading anything! I don’t think he’s dumb. I think he’s being being rewarded by someone or a group of someone’s to propose all these continually corrosive Postal bills. At the least it continues to foster the idea that the usps isn’t federal. It’s time to get rid of all these sneaky career politicians. Senator carper must hate federal employees and postal workers. Years of loyal service means nothing to him. For shame senator carper admit to world you are now a Republican. Yet another Bill introduce to hurt hard working middle class families.The more benefits you decrease or take away, the less money we will have to support America.